Avatar Korra meets the adult coloring book craze! This beautiful book comes packed with forty-five highly detailed, black-and-white images to color however you choose! 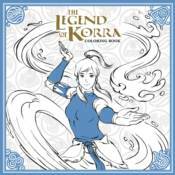 With illustrations by artist Jed Henry, and produced in close collaboration with creators Michael Dante DiMartino and Bryan Konietzko, this book is a must-have for all Korra fans! o Includes 45 pieces of beautifully detailed, original black-and-white artwork! o Artwork by Jed Henry (Avatar: The Last Airbender Coloring Book)!